Packing and moving few particular items can be a mess and one thing that is actually complicated to handle is refrigerator. It is undoubtedly a very important part of the home but at the meantime it is something much complicated to pack and move as well. If there are professionals to manage the same then it can be done with no hassle but in case a person is supposed to manage everything by own then actually it becomes a hassle. For those who want to make a move with this very important possession of their home, here is something very important that they will relate and hence could pack and move the refrigerator in the safest manner. 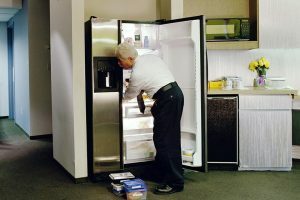 Measure: The first thing that you are supposed to do is to measure the size of the refrigerator. This is necessary as it will help you in calculating the space that would be required to move the refrigerator. Pathways and doorways are the places you need to measure for the easy moving and shifting. Gather Supplies: Packing refrigerator is daunting because adequate packing supplies are required for the same. To ensure that it is moved safe, one has to wrap the refrigerator in the proper packing material. For the best result using the original packing box would be much efficient. Clear out Contents: The entire content inside the refrigerator should be cleared. This is necessary because it will help out in packing it efficiently. Also, if you are moving to a longer distance then keeping things inside refrigerator would not only disturb the process but will also spoil the inside surface. Unplug: You should unplug the refrigerator a day before packing the same. This will ensure that all the residual ice in it will melt so that the packing process would not become messy. Remove What You Can: Whether the refrigerator trays or stands, all the removable should be removed. This is required because it would ensure that things will reach to the place safe and that too without scratches or damages. Wrap Chord and Secure Door: The chord of the refrigerator should be wrapped properly and also you should secure the door with tape. These are the few efficient tips for packing refrigerator. In order to have the safest round of relocation you should follow the safety tips. This article is presentation of Bangalore Local. This is a website that provides information about local packers and movers in Bangalore along with their rates and charges.